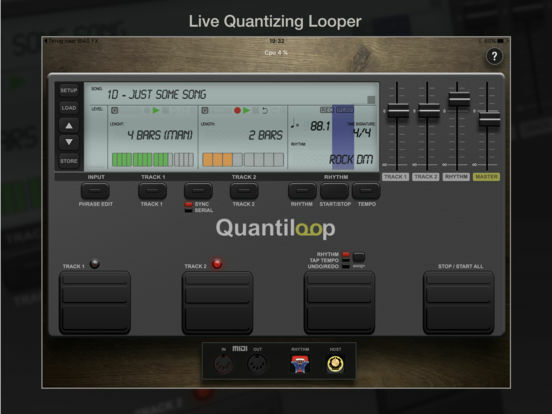 Built for Live performance and hands free use, Quantiloop recreates the simplicity of a hardware loop pedal in an iOS app. Attach a MIDI foot controller and control it the way you want. 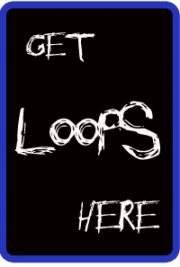 No MIDI controller at hand; just preset your loop length, enable auto–record or a count–in and your loops will automatically close, no hands or feet required. Big onscreen controls allow for easy configuration and tactile control by vocalists or beat boxers. Focus on your performance instead of fiddling with dip switches or complex menu’s. * Full input routing. Quantiloop now has 4 configurable inputs. * Routings are remembered per device, so once set up if you move between interfaces your connections will be remembered. This update improves on the MIDI control capabilities, by adding MIDI note message support and several additional MIDI control actions, enabling workflow emulation similar to virtually any hardware loop pedal. Additionally individual stereo panning controls for each track have been added. Create two tracks with endless layers of overdubs to build your performance. Record a Chorus and Verse in each track and switch between them seamlessly, or create a 1 bar percussie loop on track one, a 4 bar chord progression on track two and layer a bass line on top, all in perfect synchronisation. The builtin rhythm guide provides a rhythmic backing. Use the internal metronome for practice, import drum loops from virtually anywhere or host and control your favourite rhythm apps to enhance your performance. Ableton Link you lets you even play in time with external apps and devices. Quantisation aligns your actions to the nearest measure or beat so you stay in time, and real-time tempo control sets the pace. Prefer setting your own pace, disable quantisation and Quantiloop will react to your actions with minimum latency to create tight synchronised recordings.